BOSTON – Massachusetts remains one of the most liberal states in the U.S., but a Republican tide has pushed the nation closer to the GOP corner, a new survey of Americans’ political leanings shows. Gallup tracking surveys show 20 states were either solidly Republican or leaning that way last year compared with 14 either solidly or leaning Democratic, the first time the GOP had an edge since the polling began in 2008. In that presidential election year, the odds were stacked in favor of then-Sen. Barack Obama with 35 states in the Democratic column and just five counted as Republican. Those states that aren’t grouped in either party’s column are up for grabs in November, Gallup said in announcing the new data Wednesday. And despite the shift in state tallies, Democrats retain what could be a decisive edge as presidential nominees jockey for the 270 electoral votes needed to win the White House. Last year, a significant shift occurred in what had been a roughly even split of states between the parties, Gallup reported. 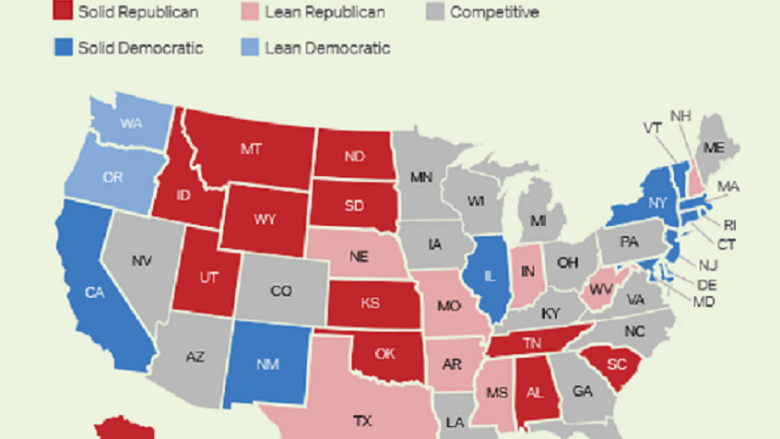 It said 11 states moving toward the Republican column, including three – Maine, Michigan and Pennsylvania – that moved out of the Democrats’ corner to become competitive and five – New Hampshire, West Virginia, Missouri, South Carolina and Texas – that shifted into the GOP camp from toss ups. New England remains the nation’s most-liberal region, but Bernie Sanders’ home state of Vermont tops Massachusetts in terms of the proportion of residents who self-identify as liberal, at almost 40 percent compared with close to 33 percent. In neighboring New Hampshire, site of the first U.S. presidential primary vote next Tuesday, more residents say they’re conservatives than liberal, at about 35 percent v. 23 percent, but the biggest category is those who say they’re moderates, at almost 38 percent. Rhode Island ranks third among the nation’s most-liberal states, but in Connecticut, conservatives outnumber liberals while moderates top both. Maine’s shift toward Republicans can be seen in the 35 percent who describe themselves as conservative compared with 24 percent liberal. 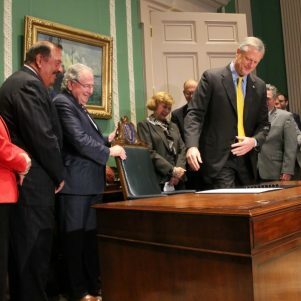 While unenrolled, or independent, voters in the Bay State outnumber those registered as members of either major party, Gallup data show a bare majority – about 51 percent – identify as either Democrats or leaning that way compared with 32 percent Republican. In the Granite State, where independents can vote in either party’s primary, the breakdown is about 46 percent Republican and 38 percent Democrat. Massachusetts trails Vermont, Hawaii and Rhode Island as the most Democratic states, while Connecticut is 10th, Gallup’s data show. Several of the most-populated states round out the top 10, including California, New York and Illinois. The most Republican states are all generally rural, led by Wyoming, Idaho and Utah. Even so, more Americans say they are conservatives than liberals. “Nationally, many more Americans say they are conservative than liberal, and consequently, conservatives outnumber liberals in all but three states – Vermont, Massachusetts and Rhode Island,” Gallup said. Still, despite that tally and the drift of states into the GOP column, the electoral math for 2016 favors the Democratic nominee. “The 20 states that Gallup classifies as solidly Republican or leaning Republican account for 152 electoral votes, less than the 187 accounted for by the 14 solidly or leaning Democratic states plus the heavily Democratic District of Columbia,” Gallup said. One conclusion it draws is that voter turnout on election day in the 16 toss-up states, with 199 electoral votes, will be a key factor in determining who wins.